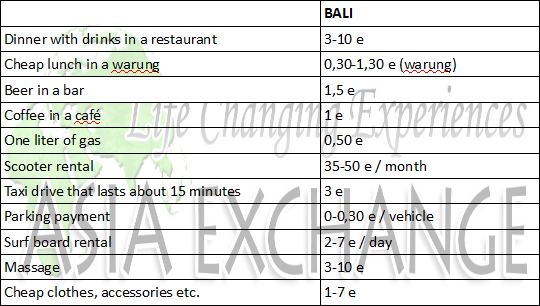 I've already mentioned the cheap prices of Bali in this blog for a couple of times. That's also one of the reasons why many students all over the world want to come to study here: in your freetime you can do so much more with your money than in your home country. For example I'm eating in a restaurant in my home country (Finland) maybe once or twice in a month. Here I do it every day. Of course you have to spend money daily also here but almost everything is still many times cheaper. I've already mentioned the cheap prices of accommodations etc but now I've composed a table where I've collected some of the most usual costs and the prices of them. These are only my estimations based on my own experiences so prices may still vary a little bit. 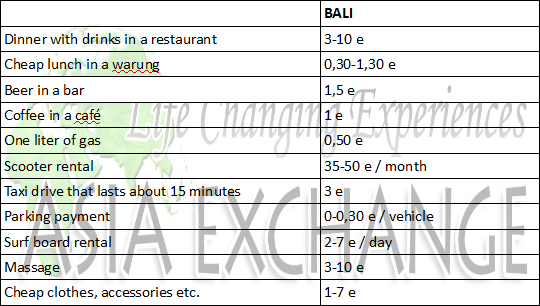 Prices are in Euros, 1 Euro is 15 000 Rupiahs (e.g. 1 Dollar is approximately 10 000 Rupiahs). I'd like to compare the prices to the prices of other countries but unfortunately I don't have that good knowledge of the prices of other countries and I bet most of you aren't interested in the Finnish ones so that's it. If you want to know what something else costs here, just comment and I'll add that in the table!